This mutual confidentiality agreement should be used when two parties are exploring possible options for a deal and neither wants the other to profit from disclosing or profiting from secret or confidential information given during the process. It will help protect both parties' personal or business information and ideas. There are lots of situations where you might want to disclose information that is private, valuable or both. Much of the time, the party to whom you divulge will be in a situation to be able to benefit from the using the information (perhaps in direct competition against you) or the passing of it on to someone else. 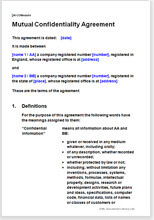 You can use this confidentiality agreement to prevent them from acting on the information and thus for protecting your personal or business information or ideas. The information in being protected can be something as basic as a customer list or as esoteric as a chemical formula. This document is drawn broadly to cover all information passing between the parties, but in a way that enables you to insert your own precise secrets if you want to specify them. Of course total secrecy is best. But there are many occasions in the life of any business when discussions in advance of a deal involve talking about secrets of some sort. This agreement will allow you to be open with the other side, develop a more trusting relationship and, hopefully, agree to a deal on the best terms for everyone. You can also manage risks by limiting the information that you disclose, and the people who know about it. Both these things are covered by this non disclosure agreement. Both individuals and business owners tend to be most diffident about asking for a confidentiality agreement from people they “trust” with their ideas, but who have no obligation to keep confidentiality (for example, potential investors, partners and customers). This is a great mistake. The upside of protection from insisting on an agreement far outweighs the downside of loss of private data. Either party can initiate use of a confidentiality agreement. You can make the other side at ease by suggesting the use of one before they do. You are considering the sale of all or part of a business. The other party needs to know details of the business, but you need to know about the financial strength of the buyer. You are discussing how to integrate products or processes together. You are considering a joint venture or partnership and each party needs to know whether the other parties can bring what they claim to be able to do. You are collaborating on a project and expertise and knowledge will be brought together (e.g. one party may have designs and the other may have unique production processes to realise the design).